It is not often that I buy home sewing patterns. When you spend your whole day making them like I do, why would you? But then I discovered DP Studio and why would you not! These patterns are exciting, innovative, and fashion focused – I bought two! I cut into this oh-so-beautiful Liberty Art Fabrics silk chiffon from The Fabric Store. It was being saved for something special, and DP Studio Le 604 Shirt with pleats and gathers was the perfect candidate. Almost. For a moment while cutting out I thought there wasn’t enough fabric- only 2m when the yield required 2.05m – but I made it! Cutting the inside cuff in plain black silk georgette, and jiggling the lay around got me there in the end. Anyway, what I love about this shirt/blouse/whatever are all the design details – from the long elbow length cuffs, the multiple front tucks that conceal the bust dart, the quirkiest cutest collar ever, to the sleeve head ruffles – every detail works together to create a really interesting piece. It always garners compliments! 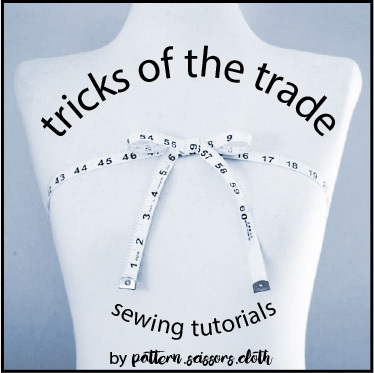 Consequently there is a lot of work involved in sewing this pattern – don’t think you will whip it up in an afternoon! DP Studio have rated this pattern for experienced sewers, and rightly so. My chiffon shirt took me about three days. Not helped by the fact that I sewed the wrong sleeve into the wrong armhole – wow has it been a long time since I did that! I had french seamed it too, and it looked so beautiful, and I had just pressed it, and I held it up to admire, as you do, and thought hang on, something’s not right here… know that feeling? the curved back yoke, shoulder ruffles, and those fabulous cuffs! There were a couple of moments where the instructions left me scratching my head and wondering exactly how things were intended to be sewn, but nothing that can’t be solved with a little creative license. I plan on writing a second blog post showing exactly how I made the ruffles, as well as the tucks and front band, and maybe some other bits and pieces too. Hopefully this might help someone who gets a bit stuck on these technicalities and runs to Google for help! Buttons can really make or break a garment, so for this blouse I ordered some pancake shank covered buttons from my friends at Hawes & Freer using their excellent covered button service. They look so dainty and I think they really finish things off beautifully. My Pfaff Passport 3 executed the buttonholes perfectly too (always a nerve-wracking moment!) In fact I sewed the complete shirt on this machine and it handled the silk chiffon with aplomb. So what do you reckon – is this a shirt, or a blouse? What’s your definition of each? And when was the last time you sewed the wrong sleeve into an armhole? Ooh, what a gorgeous shirt/blouse/top! I’ve also had the same question, so finally googled it, then wished I hadn’t! I had never heard of DP Studio until now, so looked at all their patterns, obviously, and that skirt pattern you chose is the one that appealed to me most. I can’t wait to see a skirt made from it! Hint hint! I will call it divine, the print and the details but how did you gandle the chiffon silk? WOW!! Beautiful – the colours, the drape of the fabric – everything about your shirt/tunic is simply gorgeous. I love it 🙂 I made one DP Studio pattern (the Asymmetric Knit Top which is no longer on their site) and there was absolutely NO way I could bring this top together. I even got my husband involved (he doesn’t sew but he’s a carpenter/carver and is pretty good at figuring out how to put stuff together 🙂 ) and he finally said there is something just wrong with the pattern. I gave up and tossed the works. I wrote to the company and they sent me SOMETHING but to be honest it made no sense to me whatsoever and they denied anyone else had ever had a problem. So I have no idea what happened but it has definitely pulled me away from attempting another one of their patterns 🙂 You’re a brave woman and clearly had much more success with your project than I did with mine! Wow, that fabric is dreamy!! The self covered buttons are just beautiful – I wish I had more reasons to shop at Hawes & Freer as they are such a great business. I have no idea what a blouse is really, I think it’s one of things that you just kind of ‘know’ or at least everyone knows what you’re talking about even if you are using it incorrectly! No matter whether it is a shirt or a blouse, it is gorgeous and that is what matters really! It is definitely worth all the effort for the design details alone! Wow what a stunning blouse/shirt. I really like the buttons and also have a soft spot for Hawes and Freer. I really enjoyed reading about their business that was written up in the Herald (I think) following the Made in NZ debacle. Your shirt is stunning. I love dp patterns for their unique style but I know their instructions can be confusing, they really should improve them. I made their trenchcoat and it was a lot of work with scratching head moments. This shirt has been on my sewing list for a moment and your fabric choice is very inspiring. Everything about your new blouse/shirt/tunic/top is wonderful! Love the fabric and the covered buttons and your obvious mastery of slippery cloth. A long time since I’ve sewn the wrong sleeve into an armhole, but this week I managed to sew bust darts at different angles. It did not look like a design element. Managed to recover the situation, by cutting off at dart level and creating a new lower bodice, incorporating the dart in the seam and was most impressed with the result. Reading all those drafting books and blogs paid off! Perfect blending of fabric and pattern, all topped with wonderful skills! It’s absolutely stunning! I adore all of the details. It showcases your amazing skills too. What a fabulous blouse………………..yes, I think of it as a blouse rather than a shirt. Don’t ask why!! Beautifully made as always, and the way you have styled it Is just perfect. that is so pretty! and I always wonder what defines a shirt or a blouse. I end up referring to things as blouses if they are made with silk or other fancy fabrics. I sewed a couple of silk chiffon blouses last year, also with long pin tucks and they were quite the challenge! so I will be interested to hear how you mark the tucks. I think it is a tunic, which is a timely reference. Currently you should be seeing that tunic, dress, and even floor lengths are being shown over pants, and it appears this easy trend will continue. And you are a braver soul than I am to do pin tucks and buttonholes in chiffon , I always learn something on your site, thank you. This is such a beautiful blouse/shirt/tunic – name it what you like. I have a few DP studio patterns for my daughter, but haven’t attempted them yet. Must get onto this soon. I love their patterns and had them delivered to my cousin in France and picked them up on my yearly visit. There seems to be a great deal of detail in this blouse, which would make it an interesting project, and the fabric is perfect!!! Amazing work!! Wow, this is stunning! The combination with that fabric and that print too, is amazing. I have heard of this pattern company I think, but it is fun to see one of their patterns realized into such a beautifully executed example of a garment! So soft and pretty. Definitely a blouse! The blouse is gorgeous. A perfect match for pattern and fabric. And I don’t think I have yet sewn a sleeve in the wrong armhole. It’s a shirt. It’s a blouse. It’s a tunic. It’s a topper. My uncles — all born in the late 1920s-early 1930s — referred to their upper garments as a “blouse” until the day they died. Depends how old you are and how “country” you are, I reckon, as to what you call the things you put on your body. I recently sewed a cuff to a sleeve backward so it opened the wrong direction. I noticed of course after I’d finished all the top stitching. Luckily i had plenty of fabric and decided to cut a new sleeve and new cuff instead of spending the time ripping it out (also 3/8″ allowances). I can only imagine having to rip the stitches on that chiffon. It’s beautiful! And I would consider it a blouse. To me blouses are flowy and soft, often more feminine. While shirts are more structured and crisp and often more masculine. So the same pattern can make both – it depends on the fabric. Imo. Button choosing is something I alwasy leave to the last possible moment because, uuugh, they can totally make/break the garment – yours are perfect. Do men ever wear blouses? Perhaps in common practise a blouse is a feminine clothing piece worn by women and a shirt is more masculine. Beautiful job Sheryll, looking forward to more on this.